Free English Tours of Sekigahara! Thanks to Gifu Prefecture and Sekigahara Town, I’ll be hosting two free tours of Sekigahara, site of the greatest and most decisive samurai battle in history. The tour includes a look at the battlefields, a full English explanation of the lead up to the battle, as well as details on the battle itself, the participants, and the result of this major turning point in Japan’s history. The itinerary is slightly different each tour, The March 10 tour offers tour members the chance to wear samurai armour and learn a number of swordfighting techniques. 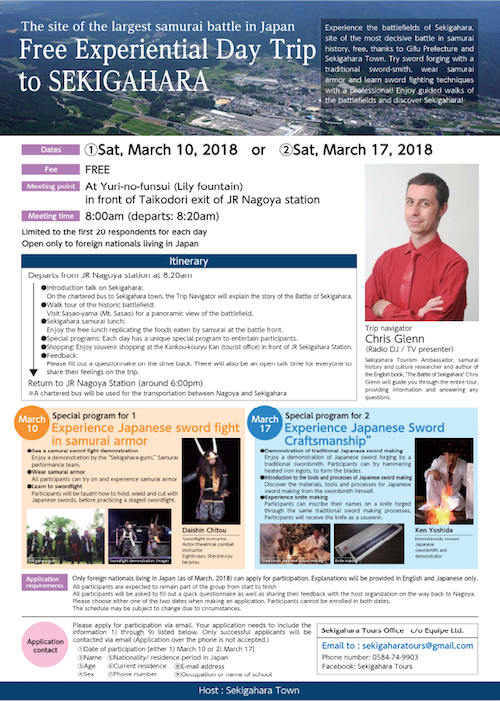 The March 17 tour includes working with a traditional swordsmith to make a samurai knife, which can be taken home as a souvenir. Sekigahara Tourism Ambassador, samurai history and culture researcher and author of the English book, “The Battle of Sekigahara“, Chris Glenn will guide you through the entire tour, providing information and answering any questions.